Ackboo’s sound needs to be experienced live, or at least on a solid sound system, preferably with 18 inch subwoofers. Otherwise, it might just not be able to kidnap your imagination and take it to where this kind of digital dub usually happens. Those remote dub tents/areas which are sometimes found at the more secluded parts of reggae festivals. Where the sound is so loud, so intense and most importantly, so psychedelic that it makes you believe you just entered a fantasy world as soon as you stepped into such an impressive sound beam. Where psychedelic dub vibrates through woods hung with lampions illuminating the silhouettes of hazy black boughs and where a dub-loving festival audience dances paralyzed by extremely deep basslines, monotonous beats, and some midi offbeat loops gathered with mind-altering delay feedbacks while the soundbwoy adjusts the frequencies on his rack like the many dimensions of the sound world he is just creating. 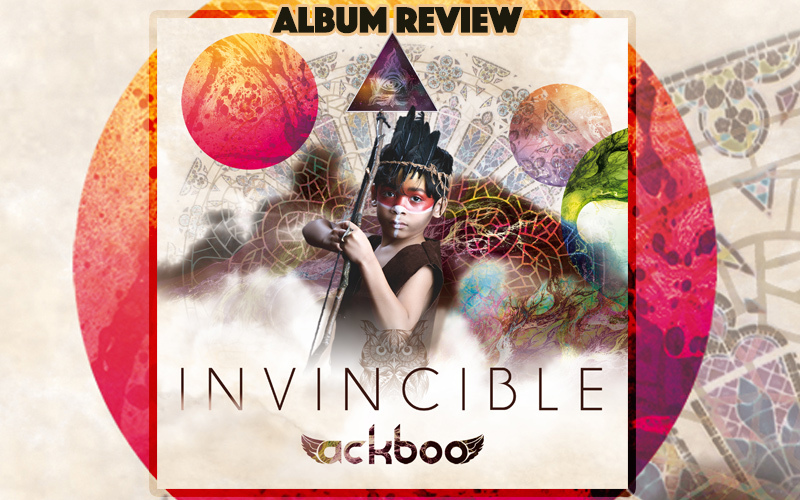 This is the scenario I like to imagine when listening to Dub à la Mad Professor or Kanka, two examples for a digital dub train on which the French dub producer Ackboo would like to jump on with his new album Invincible. However, the 14 tracks have a hard time fulfilling such a high claim. Among other reasons, because of the static midi sounds taking place within a quite two-dimensional mix which sometimes makes it hard to catch a groove. Especially when your looking for sub bass frequencies where there simply are none no matter how far you open the bass control on your mixer. Versatility is rare in terms of arrangement, too. Instead, the tracks proceed rather predictably from one part to another without really being able to establish one sphere and leave it for the sake of another, preferably through an interesting transition created by delays and filters, or other instruments dub doctors usually use. The rich variety within all the monotony created by the often minimalist repetition of elements, which usually accounts for the charm of dub, is hard to find on this release. Wet and dry don’t really take turns or create contrasts. Instead, the same loops come in again and again without alterations in EQing or register. It must be said, however, that Ackboo sets himself apart from other dub producers with a preference for the digital not only through his relatively static sound, but also through the high degree in which he uses the sound aesthetics of techno rather those of reggae and dub. Most of the 14 tunes rest on a mid-tempo Steppas beat, which, due to the drum sounds, especially the base drum, very often creates a feeling close to four-to-the floor techno. Progressive in this way, he was able to win some renowned names for his new album. Among those are Horace Andy, Brother Culture, Solo Banton or the voice of Linval Thompson, which Ackboo honored with an even more digital version of Dreader Than Dread. Except for three instrumental tracks, Invincible features Dan I Locks, Marcus Gad, Green Cross, S’Kaya, Malone Rootical and Maicee, whose creativity in terms of topic and lyrics doesn’t necessarily exceed the quality of the riddims. As mentioned above, it would be interesting to see these tunes performed live. Very often, a live performance is completely different from the studio one. And when the volume leaves no room for lamentations about sound aesthetics, when the artiste himself takes care of the mix and when parts are arranged spontaneously, probably the music can shine in a completely different light. Therefore, try to catch a live show in order to form your own opinion, or listen to Invincible on a sound system of your choice.